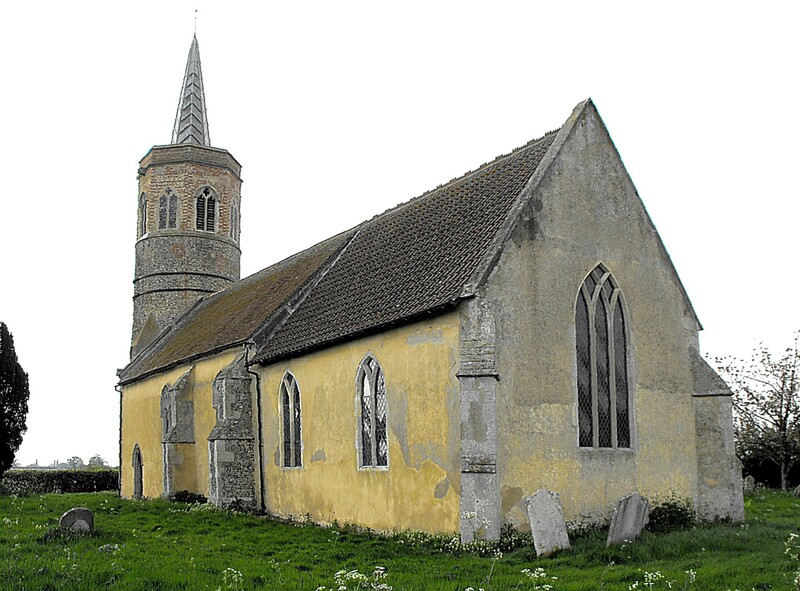 This church (shown above from the southeast, and below left, from the north), now in the care of the Churches Conservation Trust, is one of several in the area between Diss and Harleston that has a round tower with an octagonal belfry. (Cf. 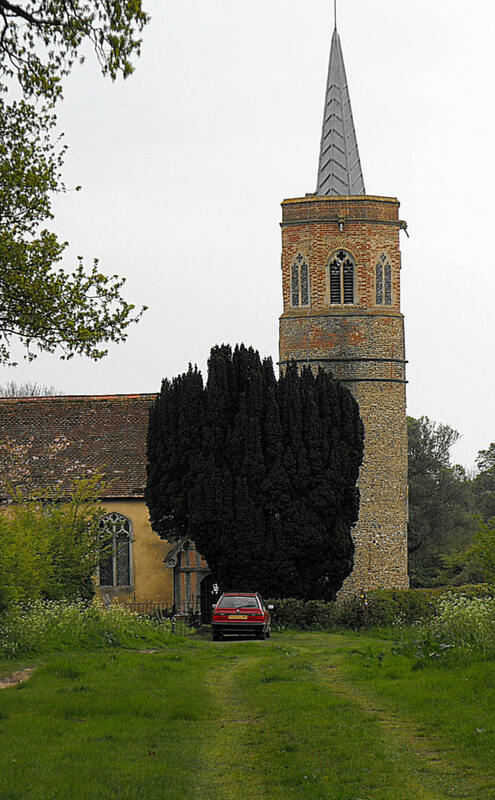 Thorpe Abbotts and Stuston, of which the second is in Suffolk.) It is also another whose church guide (in this case, by Paul Cattermole, 1995) and entry in The Buildings of England (in the Northwest & South Norfolk volume, by Pevsner and Bill Wilson, Penguin, 1999), should both be disregarded for their dating interpretations, leaving the visitor to turn instead to Stephen Hart’s meticulously observed study, The Round Church Towers of England (Lucas Books, 2003), which includes a detailed examination of the present building. In brief, Hart’s account of St. George’s constructional history is based on his conclusion that the stair incorporated in the tower wall to the southwest, is contemporary with the tower itself, and that the tower is thus no older than the bricks used in its risers and newel, although (as he also points out) there are, in any case, quite a lot of bricks used elsewhere in the circular stage of the tower (as well as the octagonal belfry), some of which form conspicuous vertical bands that are most unlikely to have been inserted into earlier masonry. This clearly implies that the circular stage can be no earlier than the revival of native brickmaking, which may have begun in East Anglia at Polstead in Suffolk c. 1180 but which did not become widespread until the end of the thirteenth century. Moreover, since there is no evidence of former bell-openings in this circular stage, it seems likely that the octagonal belfry is contemporary, which would allow the whole structure to be dated on the stylistic evidence of the bell-openings, which have reticulated tracery typical of the early fourteenth century. These occupy the cardinal faces of the belfry, leaving the ordinal faces to be decorated by blank flushwork windows of similar design. The whole tower, therefore, seems very much a companion piece to the tower at Thorpe Abbotts, just three miles to the southeast, and although a late fourteenth century date probably fits better there, such a date is hardly beyond the bounds of possibility here either, leaving Hart to speculate that, perhaps, the “tower and belfry was the work towards which the rector left the sum of one mark [66p] in 1386”. Internally, the tall pointed tower arch is noticeably off-centre towards the north, and Hart argues that the reason for this was to allow a greater thickness of wall to the south in which the stair could be set. The rest of the church consists of a chancel, nave and N. porch. 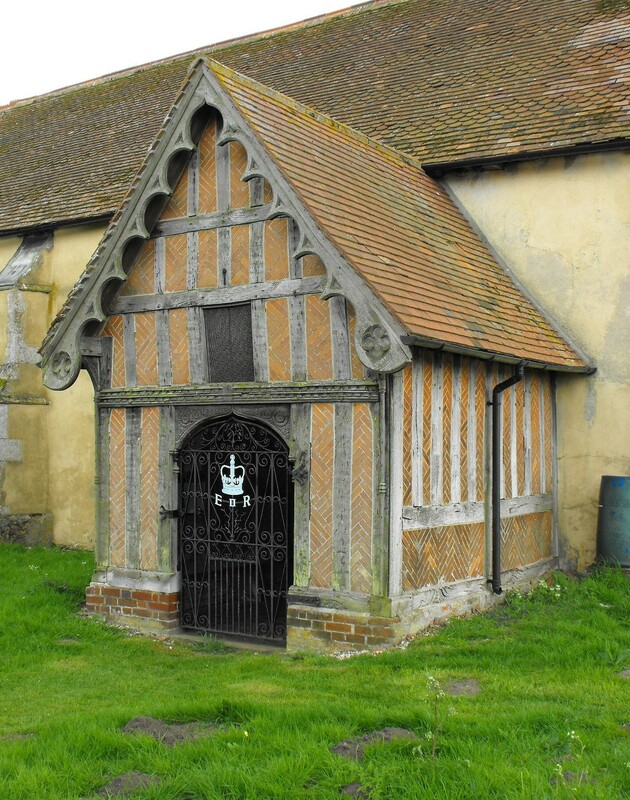 The porch (illustrated right), like the steeple and tower W. window, is the work of 1863-8, although in this case, it replaces an earlier structure that had become very dilapidated: an attractive little addition, it is half-timbered in mock-Tudor style, with brick-nogging infill between the studwork and nicely carved bargeboards. The chancel, however, is characteristic of Early English times, with Y-traceried windows to north and south, and a three-light window with intersecting tracery to the east, but the roof (seen at the foot of the page, viewed from the west) is now a replacement of 1633, as announced on an inscribed tie beam, which also carries the initials “N. C.” and possibly “I. B.”. 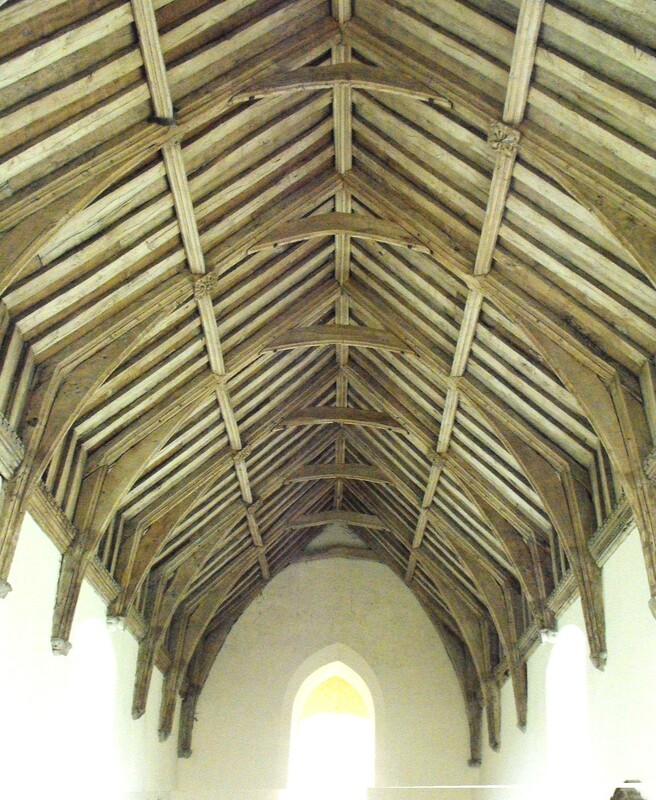 The rafters are tied together with purlins one third and two thirds of the way up the pitch, which demarcates it from the differently-framed nave roof (shown left, from the east) for there is no chancel arch to separate them. 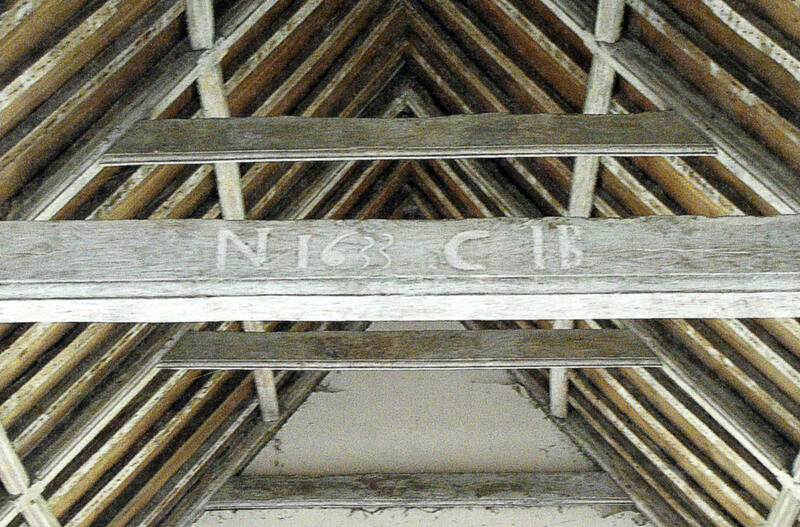 The nave roof has castellated wall plates, arched braces, and single purlins halfway up the pitch. The nave windows are Perpendicular, with supermullioned tracery beneath segmental-pointed arches. Finally, furnishings in the building include the attractive font (shown in the thumbnail, right), with the symbols of the Evangelists alternating with angels holding the Instruments of the Passion on the eight faces of the bowl, more angels on the bevelling beneath, with wings conjoined, and lion supporters alternating with buttresses around the stem. The nave benches are a confusing amalgamation of mediaeval bench ends and seats with nineteenth century backs and book-rests. The chancel furniture is all Victorian. The easternmost chancel window to the south has a dropped sill to act as a sedilia.